I have a visitor and as long as I keep feeding it, it will continue to stay. It came unexpectantly, slowing creeping into my life and refusing to leave. It goes into hiding and only comes out when I’m sitting. It’s favourite snack is Liquorice Allsorts and it loves it when I devour a whole bag in one sitting. 1000 screaming calories cheering me on. So I came up with a game plan to get rid of my visitor. This unopened bag has been sitting on my desk for approximately a month. It is a symbol that represents all the junk food that I have been devouring to bring my visitor to me. My visitor’s name is “Muffin Top” a.k.a. “Spare Tire” and “Love Handles”, and it will have to deal with my non-commitment to any calorie intake that exceeds my limit of 1200 to lose weight and reach my goal. This is how it works. During my grocery shopping, I use to grab a bag of Liquorice Allsorts or Swedish Berries to snack on while I work. Unfortunately, this habit is a failure as I will consume the whole bag in one afternoon. So now, I can refrain from buying a bag as I already have one at home. However, when I see the bag on my desk, I choose not to open it. As long as that bag remains unopened, it gives me the willpower to continue with my weight loss program. When I started counting calories, I realized that I have been consuming more than the 1900 calories allowed to maintain my current weight. Thus, the weight gain. This totals just over 1800 calories. That leaves me 100 calories left for snacking. I was grabbing handfuls of nuts, chips, Swedish Berries and Liquorice Allsorts throughout the day. Trust me, these handfuls represents at least another 1000 calories. No wonder my visitor came into my life. It’s okay if I performed some type of exercise during the day that would have burned up the excess calories, but that wasn’t always the case. It’s simple math. It’s what we learned in elementary school. 1900 calories per day – 2500 calories consumed = negative 600. Yes, that’s a negative which equals “not good”. 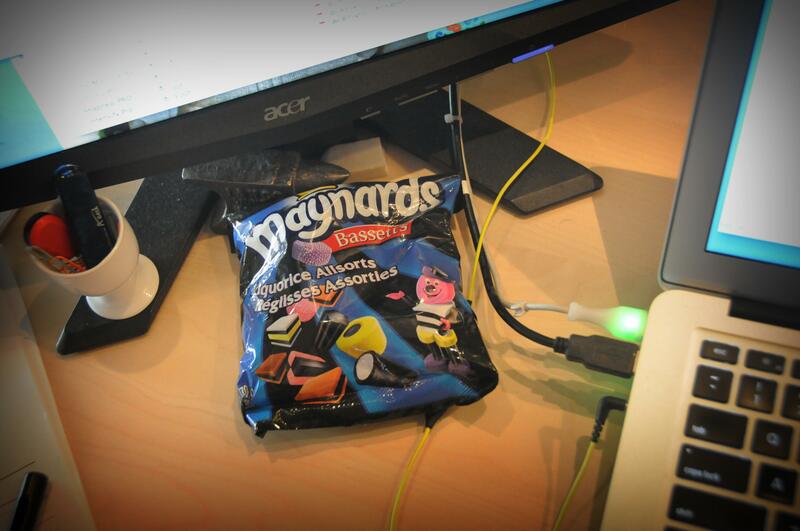 This whole blog entry may backfire on me and I may end up ripping open that bag of Liquorice Allsorts. Hopefully, it will be long enough down the road that they will be too stale to eat.